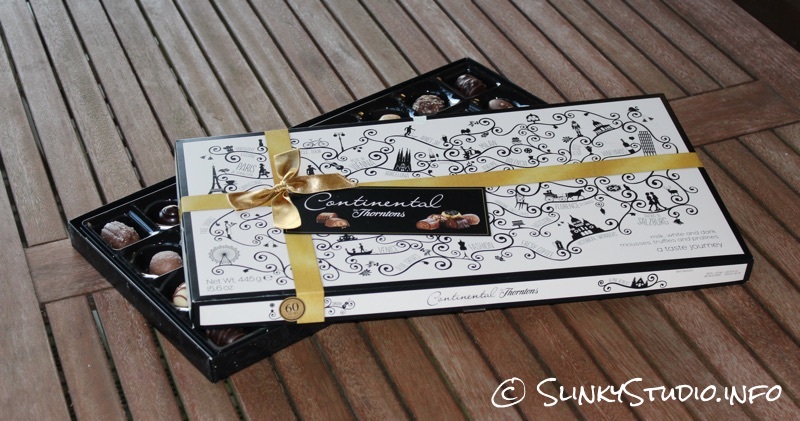 To celebrate the birthday of the Continental, Thorntons have released this box of chocolates, referred to as the Thorntons Continental 60th Birthday Box. Decorated with a gold bow and textured gold printed ribbon, upon the usual Thorntons Continental graphics, it's a box of chocolates that's already presented as a luxurious gift, perfect for the approaching holiday season. When we lift the lid we're treated to an extravagant visual display of thoughtfully and highly alluring decorated chocolates. Little touches like the Alpinis, shaped like logs and dusted in white chocolate to replicate snowfall, are what make a selection like this so special. In total there are 35 chocolates in this box, thirteen unique; consisting of pralines, mousses and truffles wrapped in milk, dark and white chocolate. These are made up of Alpini, Cappuccino, Viennese Truffle, Mousse Au Chocolat, Vanille Truffle, Cherry Truffle, Ganache Au Marc De Champagne, Sicilian Lemon Mousse, Valencia, Chocolat Riche, Hazelnut Slice, Diplomat and a slab of Thorntons milk chocolate. All these chocolates are beautifully rich, so should give a family of four at least two days of enjoyment. All chocolates are gluten free and vegetarian, even the Turkish Delights. The contrasting tastes, inspired by the customs and cultures of Europe, work tremendously well, producing a box of chocolates with a vast range of flavours to keep interest going to the end. Cappuccino is high on our list of favourites; however, we can safely say that we don't dislike any of the offerings! Chocolate and coffee tend to compliment one another well, but Thorntons have paired the distinctive flavours brilliantly in a light mouse. The outer white chocolate shell doesn't distract from the coffee flavour and instead infuses a creamy milk-like quality to the overall sensation when eating. For a memorable treat, we enjoyed the Cherry Truffle: discovered on the first bite is a thick top layer of cherry purée on top of a smooth and sweet milk chocolate truffle. The flavours flow together, presenting the charming reminiscence of a black forest gateau. 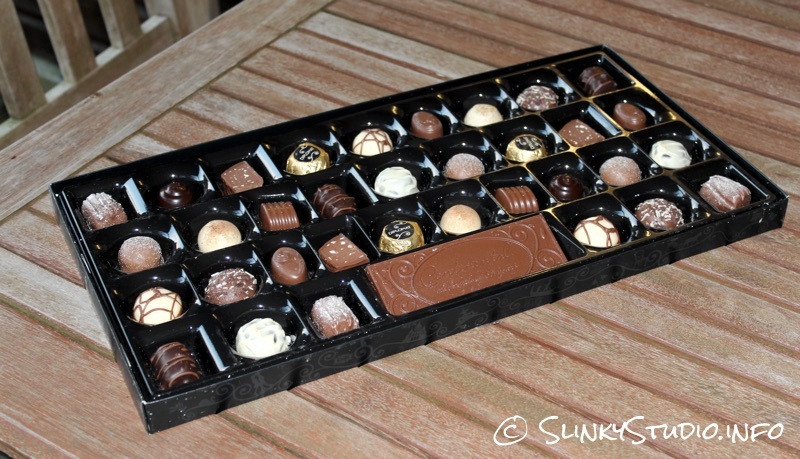 In summary, what we like about the Thorntons Continental 60th Birthday box of chocolates is that it's truly a refined, interesting and delightfully delicious chocolate selection box that is not bombarded with any fudges and toffees. It is, in fact, completely exclusive, making it worth the price tag.